When it’s cold, the wind picks up out of nowhere and amplifies it. When it’s hot, the wind suddenly disappears. Luckily for us, fans allow us to keep the power out of Mother Nature’s hands. Check out our recommended picks below and let the cool air flow through your man cave. Most notable for their tall statures and modern looks, tower fans use their height to distribute air over larger areas. Despite being relatively new to the scene (in comparison to the other types below), this is where the technological advancements have taken place in recent times. Programmable oscillation, ionizers, filters, and smart home capabilities have made them an essential part of man caves located in hot, muggy areas. It should come as no surprise that a Dyson product is one of our top picks. Notable for their futuristic bladeless designs, each one in their catalog is something to behold and well worth the price. First thing to note: The AM07 is ultra-quiet. Sound from the blades (even at full power) is trapped internally while the machine oscillates from side to side on what seems to be a well-oiled pivot. It is powered by their patented Air Multiplier technology which is essentially a reverse vacuum cleaner, pushing air out rather than in. This provides a smooth, consistent flow of air without the noise that comes with having blades exposed . Included is a remote which offers ten different airflow settings; oscillation controls, and the ability to programme when it turns on/off. Even while providing a consistent draft throughout our house and controls at your fingertip, Dyson’s engineering department has made built it to consume 10% less electricity than their older AM02 model, one of the most efficient fans of its day. Three color combinations are available: White/Silver (pictured), Iron/Blue, and Black/Nickel. For a slightly more modest alternative, the 42” Wine Curve Tower by Lasko lacks the space age aesthetics of the Dyson but has all the functionality you need. Speed - A single button which cycles through three speeds of air flow (low, medium high), each being extremely quiet. Oscillation - Nothing too fancy but will keep your entire room cool. Timer - Program it to turn off between 30 minutes to 7 hours and 30 minutes later (If not set, 7 hours and 30 minutes is still the longest it can run without interruption). Ionizer - By releasing negative ions, bacteria and dust particles floating around are cleared from the air and onto surfaces. Picture rays of sunlight entering your room, uncovering clouds of dust, material, skin cells, and who knows what else. Ionizers do a great job of clearing that away so you don’t breathe it in. And as with all other Lasko fans, it has a fused safety plug which instantly cuts off electricity in the event of an outage or surge. Who is this for? People with smaller budgets who may or may not suffer from allergies yet still want the features found in the big boys. Despite not having all the bells and whistles found in tower fans, there is a reason these are found in every school and small business in America - they are reliable workhorses. Unless your room turns into a makeshift sauna during summer, pedestals give you the biggest bang for your buck. This particular one stood out to us because it goes above and beyond the basic requirements. On top of still being price competitive, there are three things which set it apart from the rest. Power - As a manufacturer, what do you do when you’ve pushed the pedestal fan to its limit? One option is to take Dyson’s approach and hide the blades internally. The other, like you see here, is to double down and create a dual blade design. Note that this isn’t a case of “why not?”. Having a second set of blades significantly boosts airflow with only a slight increase in power consumption. Couple that with 90-degree oscillation and you can clear any room of dry, stale air in a matter of minutes. Tip: Look for a diameter between 16” to 20” (ideal for most households). Anything bigger and you are getting into the industrial territory which will drown out the noise from the TV and blow your paperwork across the room. Controls - It comes with a remote control and large digital panel on the unit itself, uncommon in fans of this type. This lets you choose between six speeds, program it to turn on after X hours, and whether or not it oscillates. Adjustability - The top can tilt vertically. Though seemingly minor, those of you who’ve had to wedge magazines underneath to achieve the same thing will know how handy it is. Cleaning is more tedious since you have more crevices to worry about, but that’s a small price to pay considering what you get for the price. With a streamlined exterior and features fit for a modern home, this fan from Vornado is the embodiment of functional design, with the price to match. The protruding top and swirling air vents aren’t just for looks (imagine this in your retro-themed den), they are claimed to create a vortex motion which helps circulate air. Speed controls - A common pattern we found while researching the best man cave fans is that speeds consist of low, medium, and high (if at all). While fine in most cases, sometimes it just doesn’t cut it. This model offers 99 levels of speed, allowing you to select the ultimate flow. Note: anything past 60 will result in a noticeable noise change, but you will rarely need to reach that level. Energy efficiency - Being run by a brushless DC motor means that significantly less power is needed to achieve the same thing as its AC motor counterpart. The programmatic timer can be set for 12 hours in the future, making sure it’s on when you’re there and off when you’re not. This is the result of engineers and products designers being on the same wavelength. If you have a few extra dollars handy, this is your guy. Whether a standing fan isn’t sufficient or your floor is already fully occupied, interior roof fans may be more your style. Just make sure your ceiling is high enough. The last thing you want is an unexpected haircut! Installing something in a ceiling is no simple task. It is critical that you do your research and ensure you are buying a fan that fits your specific situation. This contemporary creation by Minka Aire is constructed out of high-quality material and is perfect for both high and low ceiling heights. For a cheaper alternative, this 52” fan lacks the details of the one above but is just as tough and reliable due to being manufactured by Westinghouse. Its five paddle-like steel blades (color options being plain white and textured wood) are connected to a decent 0.6” silicon motor which can--on top of changing direction--operate at three speeds: slow, medium, and fast. Great for rooms under 400 square feet and low ceilings. Ever find yourself lounging in your den only to be surrounded by stale air? It isn’t bad enough to warrant buying one of the above, but it gets increasingly off-putting the more you think about it? A small, compact fan is just the ticket. Unlike the other fan types covered above, the quality between a $15 tabletop cooler and a $100 one is so minimal that you are better off buying cheap and replacing it when it loses effectiveness. 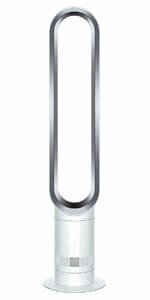 This little unit may not oscillate or turn on when a certain temperature is reached but is surprisingly powerful given the size of the blades and ultra reliable given the price. The three settings--off, high power, and low power--are controlled by an unobtrusive and accessible knob on the front. Having a raised base not only allows air to travel under, it creates an illusion of it taking up less space than it actually does. Table space is precious, every inch counting. Travelling from my man cave to my place of work and back nearly 20 times a week means AC power isn’t always there. However, with a laptop and USB powered cooling device, I can escape the heat anywhere I go. This particular model from OPOLAR features 3 different speeds - slow, medium, and fast. To give you a reference point, the max speed equates to an airflow of 4.2m/s which is labeled as a gentle breeze, according to the Beaufort wind force scale . Anything more will chew through the power and topple over. One reason why it gets away with being so small is that all the controls and electronics are tightly housed at the bottom, allowing for larger blades and more efficient ventilation. Nowhere to plug in the USB cable? It can also run off a single rechargeable lithium-ion battery (included in the box) which will give you a few extra hours of reprieve from the heat. Now all you need is a grape-feeding robot to become a 21st century Julius Caesar!